See How Bambrella Stands up to 90mph of Strong Winds! Bambrella Side Wind Sirocco 3.0m Round with Spuncrylic Cover: The Sorocco side wind range features small side pole parasols which are suitable for both domestic and commercial use. There are 10 beautiful and stylish spuncrylic fabric cover colours to choose from to really customise your outdoor space and create that wow factor. All Bambrella parasols are designed with durability, strength and style in mind and the Sirocco Side Wind is definately no exception to this rule. The included Bamboo base has adjustable feet making it easy to use even on unevent surfaces. 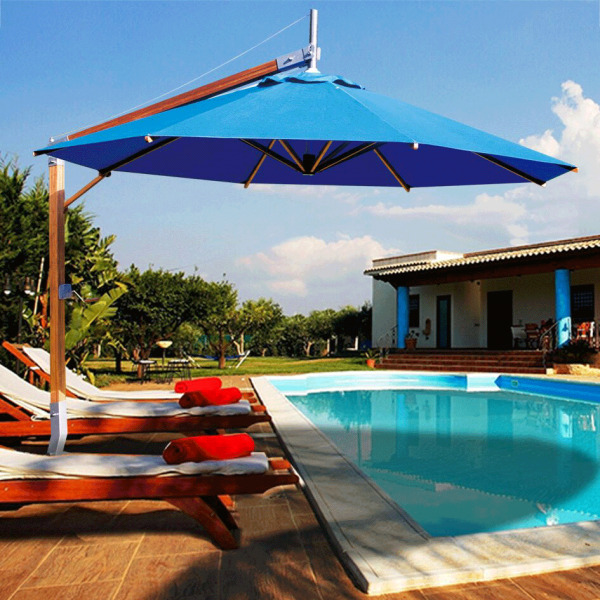 This parasol uses a special type of polymer bearings to prevent any rusting or seizing up in the mechanisms over time. Spuncrylic® is polyester that has gone through a process called solution dying giving It very high resistance to fading from sunlight. Spuncrylic® also has good stain resistance and water repellence. In addition it has a UPF of at least 50. This material has a similar performance to acrylic but at a much more affordable price.